Danaë Killian has studied Schoenberg's music and thinking all her adult life, first performing his complete published solo piano works in recital in Basel in 2001. She writes: "Schoenberg's philosophy of the relationship between musical ideas and their presentation ubiquitously informs my categorical thinking on the fundamental questions of being and of ways of knowing. It is my destiny, it seems, to need to think the structures of existence through Schoenberg. 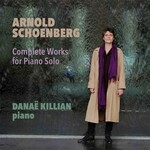 Consequently, this recording is accompanied by my extended essay, For Grasping Schoenberg: An Epistemology of Sense and Meaning in Word, Music, and the Moving of a Pianist's Arms-which is not so much about Schoenberg as an outline of how one might think toward this notoriously difficult modernist composer."